The 2014 inaugural conference of prefabAUS brought together representatives from the related areas of architecture, engineering, manufacturing, material supply, property development and construction, universities, government agencies and client representatives. The off-site construction industry is active in all building sectors from bespoke single dwellings to multi storey repetitive apartment towers and health facilities. 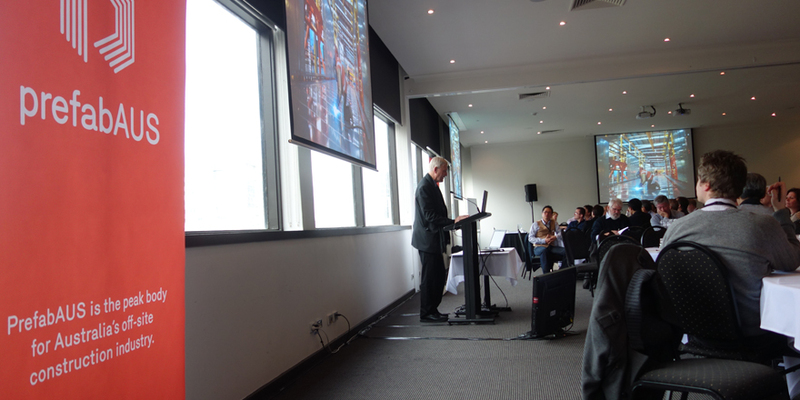 This conference saw for the first time in Australia a forum to discuss the synergies and challenges that all those who work in the prefabrication sector face while looking to the future opportunities and trends that are emerging for off-site construction. There was a fantastic representation from PrefabNZ and some leading universities as well as industry leaders. A highlight of the program included a tour to some Melbourne-based factories and projects, including representations by Hickory, Modscape & Prebuilt and a visit to the new Docklands Library building. A big thanks to outgoing acting CEO Sarah Backhouse who has been a tireless force behind the establishment of prefabAUS who has establishes its place as the peak body for Australia’s off-site construction industry.